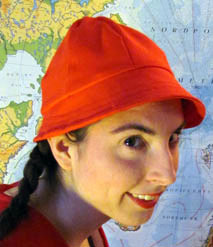 A red hat! Designed for the desert! I have a little visor to keep the sun off of my nose and forehead, and it’s a bright enough color for Clark to find me if we get separated someplace crowded. half a million people each year. I had no idea what Comiket was or how many people would be there when I agreed to go. On my first day in Japan. Ever. So, when we arrived we waited in a field in a block of oh…about 20,000 people waiting for there to be room in the building for us. When we were finally allowed to go in, we walked as a giant mass of people. And that’s all I could see: people, people, people. There was a massive staircase and people moved up it by the thousands, undulating like a wave. Inside was not much better. I don’t think I saw one piece of art through the thick, jostling crowd. Luckily, I decided to wear a eye-bleedingly neon green striped sweater, so each time the crowd split us apart Clark was able to follow the green glow and find me again. So, we were separated again and again but each time he was able to find me, grab my shoulder or my hand, and eventually guide me to the other side of the convention center and out into the blessed, less crowded parts of Tokyo. As a lesson from that day I tend to try to wear things that will help him find me if we go somewhere crowded. Cairo is crowded, I believe, so I think it will be a good idea to keep this hat handy. Anyway, the pattern is Vogue 7981 and my full review is here. By the way, Clark still apologizes for that first day. I wish I could say that this Halloween costume was a last minute idea, but I put several hours over three days into making Clark’s costume extra craptacular. Sticker lettering on felt is not the mark of quality. Still, I like the structure and it’s something that I might use again. I used drinking straws reinforced with wooden skewers as the basic structure. They’re held together with paper clips. Despite the less than stellar craftsmanship, most partygoers at the massive fete we attended got the joke. Next time I will make room in my schedule for proper prototyping. I finished my third piece for the wardrobe contest, a twisted knit shirt from Butterick 5429. The pattern, unlike the picture, sews up pretty loose, so I ended up taking out a few inches on the sides and front to get a more flattering fit. The fabric I used for this shirt is a wonderful double knit cotton. It’s thick enough not to show my bra and but comfy and sporty. I want this fabric in every color. The key to making almost any kind of zippered skirt without buying pattern after pattern is to start with a well fitted yoke. The yoke is the upper part of a skirt that fits over the hips. You can attach many, many kinds of skit to that (ruffled, pleated, flared, tiered, A-line, etc…) and each time end up with something that fits perfectly. Usually, I’ll pull a yoke off of a skirt I like and then use that over and over again. Today’s yoke comes from one of my favorite Japanese pattern books. The skirt attached to it is box-pleated and has a black bottom border. I made it to wear while giving blood tomorrow, the colors are Halloween festive. The pieces for this skirt are pretty simple: four yoke pieces (front, back, front facing and back facing), a big rectangle for the skirt cut to the width of the fabric, and a skinnier rectangle for the border, plus a zipper for the side. The skirt construction is pretty straightforward. First, I attached the border to the skirt, folding over the border in half and sewing it to itself at the skirt-border seam line to form the hem. I left a little folded over border facing open at the edges so that I could hide the side seam when I sewed the whole thing together. After that, I sewed my back and front yoke pieces together on one side. Next, I box pleated the skirt to the size of the yoke (spacing evenly) and basted the pleats in place. Then I attached the skirt to the yoke, leaving one side open. I then sewed that side shut, using basting stitches for the upper 8 inches so I could add my zipper. I’m in love with the new line of bird-themed fabrics at IKEA. They’re reasonably priced for what you get and the designs are just fantastic this season. The chickens seem to like them, too. Every once in a while I’ll learn that I’ve been doing something completely wrong my whole life, completely unaware. Luckily, when I make such a surprising discovery, I usually learn what I did wrong. Thankfully, those instances get rarer and rarer as I age, but I guess that’s what makes them more disorienting. Case in point, I have never, ever made a cup of Jasmine tea correctly in my entire life. I’ve been in love with Jasmine tea ever since drinking it every day for breakfast during a trip to Thailand. With just a little cream and sugar it is a cup full of happiness. When I returned from my trip, I was determined to continue my ritual. 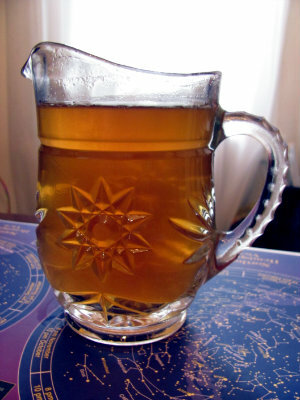 I purchased some mid-grade loose Jasmine tea and proceeded to make the world’s most bitter, face-scrunching cup of tea. I purchased better leaves and got the same result. I tried giving the leaves an initial soak before letting them steep, just like what one would do for nicer green teas. Then I tried experimenting with water temperature. Then I resorted to covering the awful taste with loads of sugar. Finally, I gave up, blaming American water for…uh…not agreeing with Jasmine Tea? Or something. I resigned myself to only having delicious tea during trips to the far east. However, I had it in me to try to suffer through one more awful cup of tea. I decided to check the internet to see if there were any good ideas for iced Jasmine tea. At least, through the magic of the interweb, I learned what I was doing wrong: I hadn’t removed the leaves after steeping for only five minutes. The leaves themselves will start leeching bitter oils if given enough time in hot water. So, I made a batch and filtered out the leaves. Finally, I had my perfect cup back. It’s stupid, but at least I figured it out after four years of bad tea. 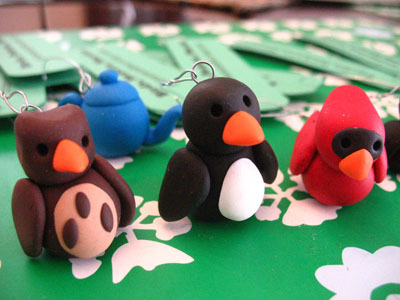 I’m making a batch of ornaments to ship out with this month’s Little Black Box sample shipment. I need to make 100, so to avoid the tedium of making just penguins and cardinals, I’ve been experimenting with making some new birds. I’m about two thirds of the way through my task and I’m astounded by how much time this is taking me. I estimated that I could do about 30 birds per hour, but it’s turning out to be about a third of that. I always overestimate my output! I think I’m going to need a break from polymer clay for a little while. I noticed a lot of new smudges around the kitchen sink, on some of the light switches and along some of the walls in the house. It look me a little while to figure out that they all came from me. There is something about the new, softer formula of that really makes it cling to the skin on my hands after a while. Even with intense soap and water, I still retain a patina of clay and the house is starting to look once again like a steel worker lives here. I think I need to find out whatever they use to clean baby ducks soiled by oil spills, buy a bucket, and spray the whole house with it. Clark’s job moved locations and now he is in the position to drive home for lunch once or twice a week. It’s been good for me as my day has been divided in a way that is a lot more healthy. I’ll usually work without stopping to eat until 3 or 4 o’clock if left on my own, meaning that I eat only two small meals a day. Not good. Still, we’re both short on time, so it’s nice to eat things that can be prepared in less than 5 minutes. Today, I put rice in the rice cooker early in the morning. Then when Clark arrived I mixed up a quick batch of tuna with a little low-fat mayo and served that on a piece of seaweed on top of the rice. For garnish I sprinkled the whole thing with roasted sesame seeds. For those of you who are a little weirded out by seaweed, I say just give it a try. It’s like eating potato chips that don’t make you feel bad and give you a full serving of green vegetables. I like eating by itself for a snack; the salty-umami flavor is divine, but it’s wonderful in a lot of dishes. Plus, it doesn’t need to be cooked or prepared in any way. Just apply it and enjoy. This set of cake toppers was a disaster from the beginning. From the benign Barney the Dinosaur looks of my supposedly vicious T-Rex, to the total collapse of my Brontosaurs (which doesn’t even exist anymore), this was a failure of design. I spent so long mix, mix, mixing the special sparkly color, that it’s a little disappointing that these are destined for disposal. I don’t know what to do with them, on the one hand it’s hard to toss anything with that much time and energy behind it. But on the other hand, what can you do with a dinosaur with a broken neck? I’ll use the T-Rex as a package embellishment for Christmas, but the other one will just have to serve as a lesson in hubris. Oh, and a lesson learned that long necks need structural integrity. I love reissued retro patterns. There is something about mid-20th century clothes that is so hard to find these days. Maybe it’s the solidness and shape of the clothes. It’s hard to replicate that using today’s construction technique and fabric-buying short cuts. There are a lot of darts and a lot of yardage in this dress and I just can’t image anyone taking the time. Still, it’s a little like wearing armor. Wearing this kind of dress makes me want stand up and take charge of something. No one can push me around in a massive, tailored dress like this. 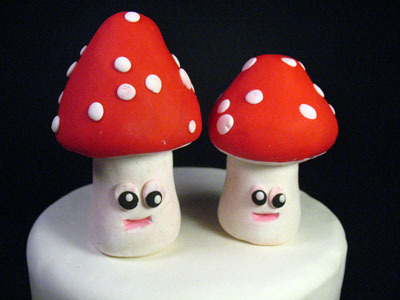 I’m trying to improve my presentation in my Etsy store, so I decided to redo some of the pictures of my cake toppers in order to make them look more cake topperish. They are already a little unconventional, so anything to put them in context would be a service. My solution was to make it look like they are sitting on an actual cake. Real cake would just get old and get frosting all over them. Plus, I hate the idea of making a cake I can’t eat. So, instead I made a reusable fake cake, one that would last and showcase my wares in the best way. 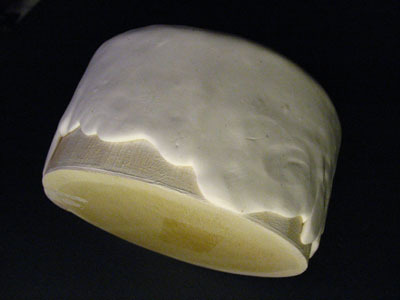 I merely took a paper-mache box from the craft store, painted it white, and covered the top with a carefully blended mix of white and transparent polymer clay, a mix that would look just like fondant. The oven temperature needed to set the clay is much less than what would burn paper, so I was able to bake the whole thing without much trouble. I am now ready for some commerce!